We are greatly saddened to report the passing of ATA Approved Stallion Abdullah. On January 5, 2000 the great stallion died of complications following a successful colic surgery at Palm Beach Equine Clinic in Florida. We extend our sincere and heartfelt condolences to Sue and Terry Williams, his friends and owners for the past 27 years, who were with him until the end. Abdullah's accomplishments in the show jumping ring will be remembered for years to come: 2 Olympic medals, 2 World Cup Medals as well as the World Cup Leading Horse title head a long and impressive list. His numerous offspring now excel in all disciplines, among them several National and Zone Champions, and there are yet many youngsters waiting to make their entrance into the show ring. Abdullah's influence on the Stud Books of the American Trakehner Association will indeed be lasting. To date he has sired 4 ATA Approved sons: Element of Surprise, Rüdiger, Sonset's Sieger and Special Memories. 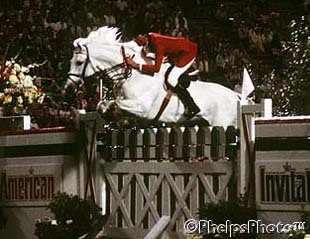 He is also dam sire of the ATA approved stallions Advocate and Stiletto and has 40 OSB daughters. In Germany he is also represented by his approved son Schneesturm. He will be remembered as one of the great ambassadors of the Trakehner breed. ATA members who would like to share their remembrances of this Trakehner legend in a special article in the upcoming issue of the ATA magazine should contact Kim MacMillan as soon as possible.